Wes Craven, creator, director and producer of some of the most popular horror franchises of the last forty years, is teaming with Steve Niles, creator of 30 Days of Night and one of the pioneers of comic books' creators' rights movement to create Coming of Rage, a new comic that will introduce the world to a group of characters that will be brought to the movie theaters shortly thereafter. 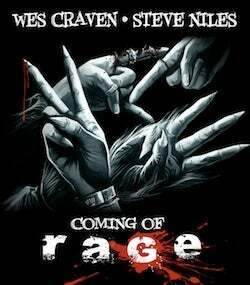 According to Deadline, Live Free Or Die Hard producer Arnold Rifkin and Liquid Comics CEO Sharad Devarajan--with whom Craven has had a relationship since 2010--are developing a feature film version of Coming of Rage with Craven. The comic book was written by Niles, based on an idea by Craven, and will be released by Liquid Comics as a five-issue miniseries and a graphic novel, according to the report. Deadline also says that the publisher is developing exclusive digital content for iOS that will accompany the digital release of the comic.